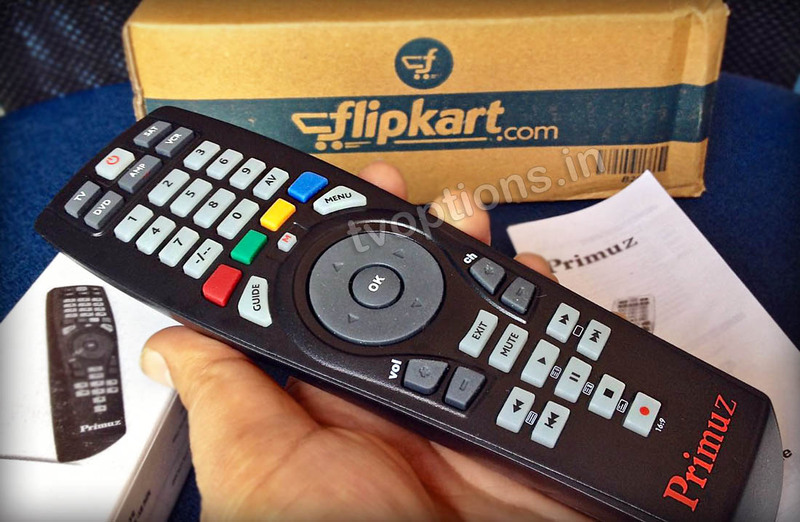 Primuz Universal UL-501 Remote Controller was available on Flipkart for Rs. 299 under an offer. Actual Price is Rs. 900. Grabbed this offer in few minutes and turned out to be real good deal. 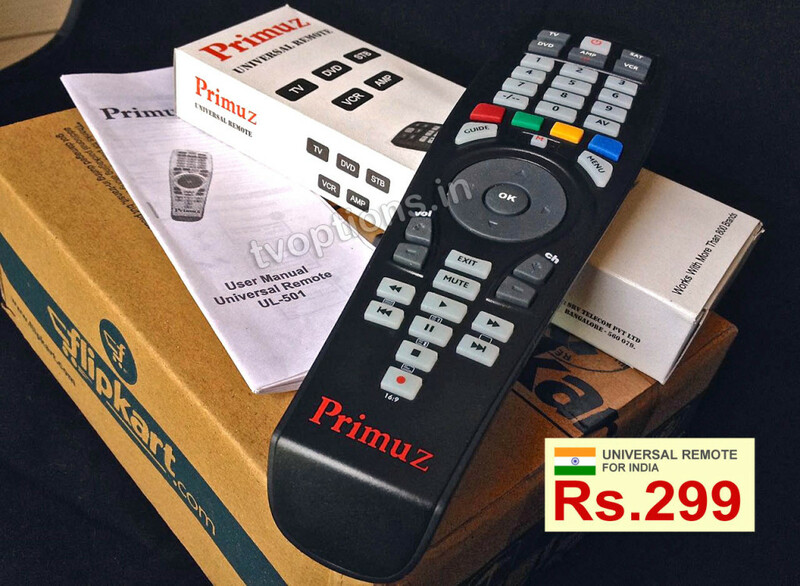 Primuz Universal Remote is manufactured by SRV Telecom Pvt. Ltd. Bangalore 79. Remote is lightweight, sturdy has nice grip while holding. 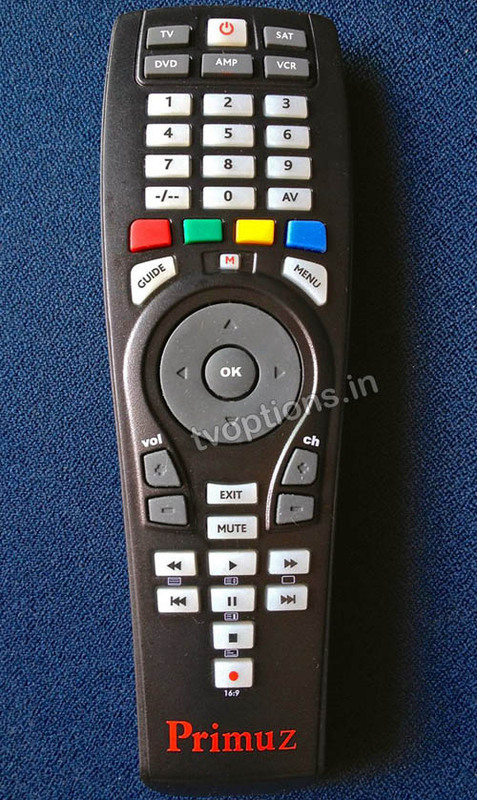 It has most of the buttons required for controlling any TV and Indian Set Top Boxes. I could easily customise this remote for LG TV and Tata SKY set top box in 2 minutes (Direct Code Setup). Configuring Apple TV took 5 minutes as I used the learning option of Universal Remote. How to customise Primuz Universal Remote for your Home Appliances ? There are three ways in which this remote can be customised for devices. 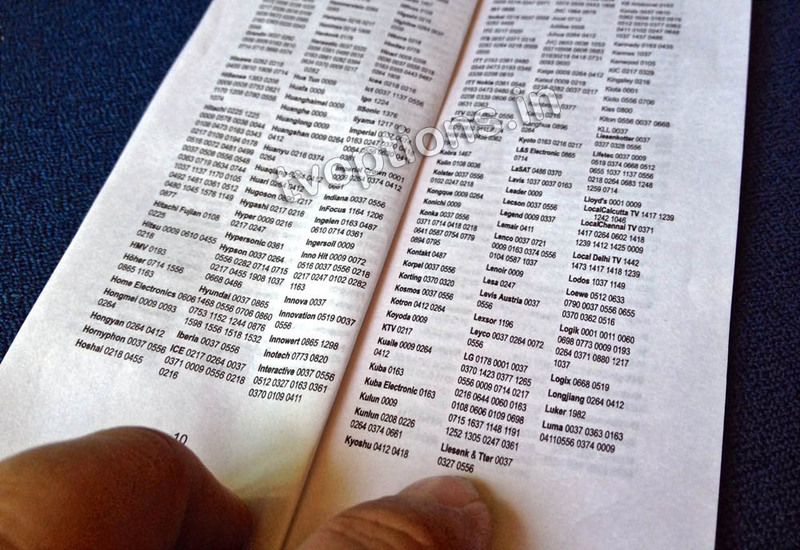 Accompanying manual has all this information and codes for Various TVs, Set Top Boxes, VCRs, DVDs, Amplifiers. Without this manual Primuz Universal Remote is useless and very difficult to use. How to configure Primuz universal remote for LG TV? Enter 4 digit code for LG TV which is 0178. The Red LED will blink twice. Your remote is ready to be used for LG TV. How to configure Primuz Universal remote for Tata SKY set top box? Enter 4 digit code for Tata SKY STB which is 1997. The Red LED will blink twice. Your remote is ready to be used for Tata SKY set top box. Primuz Universal Remote gets fully mapped with Tata SKY remote. It is even capable of invoking recording function on your set top box if it is available. Unfortunately all the Tata SKY remote buttons are not available or there is no substitute. Features like Tata SKY Active, Info Button, Plan button to visit recorded shows. Organiser and Showcase button are not available. How to configure Primuz Universal remote for Apple TV? Enter 4 digit code for Tata SKY STB which is 975. The Red LED will blink twice. Keep Primuz remote and Apple TV remote sensors facing each other. Press the function on Prmuz remote that you wish to configure like MENU. The red LED on primuz remote will start blinking. Press the Menu button on Apple TV remote. Blinking will stop. Repeat the operation 5 and 6 for configuring all the Apple TV remote buttons. Finally keep “M” Magic pressed until the red LED underneath the power key blinks twice. Your Primuz remote is ready to be use with Apple TV. Remote configuration code for Sun Direct HD Set Top Box is "2525". Please tell me if this remote control is compatible with Onida LCD TV. My older remote is not functioning. 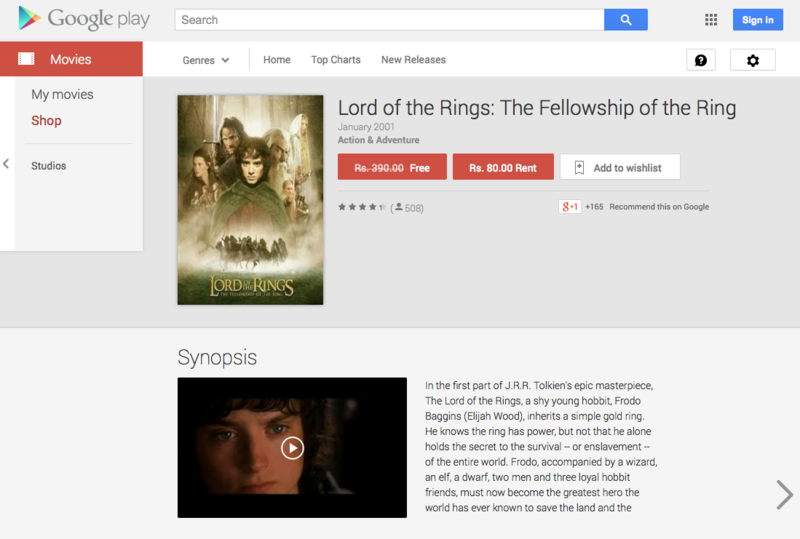 Will this review control work? Yes, It supports even Onida LCD TV. Can you confirm the code for onida tv Onida LEO32HRZ 81 cm (32) LED TV ? I bought this remote today but not able to find the code for Videocon D2H settop box. Please share if you could find. You are right, Videocon D2H is not listed in the manual. You can try the search method to see if some code works automatically, otherwise you'll have to train each key to remote from old remote. * Hold the Magic button until the red LED in power blinks twice. * Now point your remote to set top box and keep pressing ch++ button. * As soon as your set top box powers off, press the magic key to store the configuration. Later on you can use premiuz remote for that set top box. What is the code for 'In cable' STB?? Try these codes: Airtel – 2248, 2243. I've uploaded the manual for Primuz Universal Remote here which has codes for all the devices. What is the code for Philips fw v320 music system? I got Primuz 401, I successfully configured remote for my TV but I couldn't find the code for cable STB in the manual.I even tried search method as explained in manual but coukdnt get thru. You can go for train the remote method and transfer keys codes from old remote to Primuz remote. Can we use this universal remote for both the settop box and TV simultaneously? or do we need to reset the frequencies if we want to use for other device? Yes, You can use the universal remote simultaneously for 5 devices. You need to press the TV, STB, DVD, AMP or VCR and then use the remote on that device. These are just the slots. If you wish you can even configure five TVs to be controlled from same remote without reseting. 1997 code works for Tata Sky HD+ box. Manual with codes is available here. In case if it is not working with preset numbers, you can configure by search mode. Or you can even train Primuz remote from old remote. Hi Deepak, Not able to set up Philips Sound Bar DSP475U, could not found code, whatever availble there has been tried out. Can you pls. help me. You can use the train mode to configure soundbar from existing remote to Primuz Remote. Can you please provide me with the codes for PACE set top box for PRIMUZ UR 401. the codes given in the manual for PRIMUZ UR 401 are not working, even the search method is not functioning. You can even train the the Primuz remote from your old remote. You try the search mode or train mode on Primuz remote to make it work. Technically Primuz remote can control any device. It is just configuring which can be easy or hard. is it will work's on vediocon colur T.v please tell code for vediocon colour t.v and code for dish TV set top box..
Videocon TV code is 0508 or 1450. Can you let me know what is the remote code for Dish TruHD set top box. I tried 0128,1300, 1780, it doesnt work. Just check the manufacturer of your DishTV Tru HD if it is Zenega, then the code is 00128. 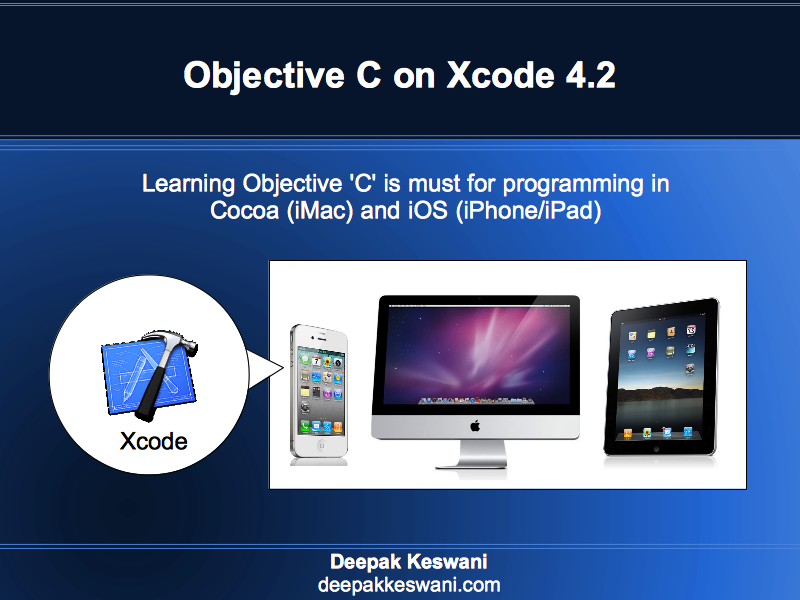 It worked like charm for me, including the guide, menu and info…. how to configure sony 32 lcd, sony dvd player & airtel stb in ur–401. kindly reply. Does this work for Sony sa id7000 home theatre. Can I set Dish TV Set top box- 03 digit Channel No. to Single digit Key No. on Primuz Universal Remote control. E.g. Channel No. 692 on Dish TV to be configured with Key No. 02 on Primuz Universal Remote control. So that when I press Key No. 02 on Primuz Universal Remote control Channel No. 692 shall be viewed on my TV. Can you give code for Hathway hd stb? i want to know the code for siti digital stb as it is not mentioned on the manual. Sir tell me code Sony LCD bravia ? Got it today from Flipkart. The learning worked just once. Now the remote does not learn. The TV and SAT which were programmed earlier still work. Tried Samsung programming code on DVD and AMP 0618 (which is working on TV mode). It does not work on these modes. Is there a way to rest the whole remote? Tried 976 on DVD and AMP. No change. Will taking the batteries out reset the whole thing? Please tell me the code of INTEX LED TV … I've bought this remote. but stuck at configuring the remote 🙁 I dont have the Original tv remote too. 🙁 please help..
Hi Deepak. Trying to get the remote to work with the Lloyds TV. Tried both codes but no luck. Also the search method doesnt work. Any tips? I am having Intex home theatre (IT-4800W) model, can anyone please suggest whether this remote can work with this intex model. I am not able to set up, My existing remote is down. I Need code for Philips dvd player – HTS35IIE. will it work for sony sa id7000 home theatre …. PLEASE LET ME KNOW WEATHER THIS REMOTE CAN BE USED FOR SAMSUNG LED TV AND D2H VIDEOCON AS UNIVERSAL REMOTE FOR BOTH . That remote working on John barrel home theatre? Is there any code for Samsung LED TV, Airtel HD DVR and Sony Home theater? remote is not working on in digital set top box delhi . For LG Disk player you may try 0037, 0480,0278 or 1137. For Onkyo Receiver you can try 1320 or 0135 codes. I have wt 1014 dvdI lost remote can use your remote. Well there are 3 modes in which you can configure this remote. 1. Find the code of your device in Manual and configure. 2. Search the code by pressing buttons so many times. 3. Train this remote from your existing remote and this remote adapts the buttons. Takes max 5 minutes once. So technically this remote can work on any kind of device TV/Satellite/Amplifier/Cable Box or even Air conditioner. I really appreciate you patiently answering each and every query. Is its work for intex n66n dvd player? please give me 1 remote control . I bought this Primuz 501 and it work very good . I seen in some review , shortcuts can be programmed by using the magic key . If that is possible, could you please let me know the how to do that? I have BenQ TV and required the 4 digit code for BenQ TV, can you pl send. Is your remote control works on set top box of Durostar HD-786 S2, this STB using to access free to air channels only, its code is 0000, may ple guide me. Can I control my Philips sp050 home 5.1 theatre system? I have lost the original remote. Also, how do I train for this home theatre? how can i user this remote for my Yamaha DSP AZ1 amplifier ..please reply i am waiting for it.